Losing a child is probably the most traumatic thing that can happen in the life of a parent. And in the year 1991, we had the misfortunate of knowing what it feels like, when we lost our daughter Sangita. Through that pain and grief, our eyes were opened to the sufferings of thousands of young children around the world; children suffering for no fault of theirs. Except for having been born in the wrong place. Our dream was to reach out to those children in need. 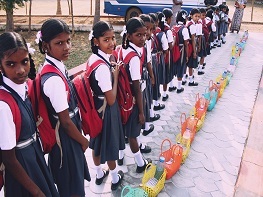 And as a small step towards that causes, the Sangita Charitable Trust was founded in 1997. Our compassion towards the helpless has focused us to concentrate on the childrens Home - for the homeless and helpless. Grace Moses while working for a private company took this challenge of establishing the Sangita home in order to fulfill the vision God laid on her heart after the death of Sangita. Her primary vision is to see many under-privileged children in Chennai become good citizens finding meaning in life. Paul Moses, a sports person who worked in a multi crore chemical company for 19 years, came into full time serving the underprivileged sports persons teaching them to be good human beings and excel in sports along with good values in life. He is very much involved in the work of Sangita and shares the vision of the orphanage. They both have dedicated their lives to serving the underprivileged children/youth/widows/ differently abled people and many others who need physical and social care , as long as they live on this earth. Sangita Charitable Trust is a Christian orphanage which cares for any child who needs home, food and love ,education... irrespective of caste, religion and denominations,started in 1997 in memory of our daughter Sangita who passed away in 1991. This organization at present has 95 children who are residents . The children are from the ages 2 to 18 both boys and girls. Sangita Charitable Trust in the past years have been able to serve through many avenues towards the social and economic upliftment of all groups of people such as children, Youth through sports development in communities ,care for widows, support to special needs people, roofs for the roofless people, in empowering young women.